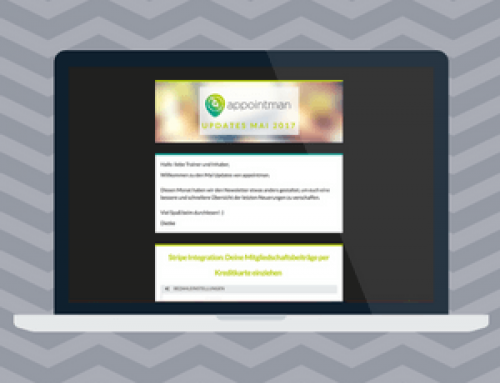 Welcome to the appointman October updates. As usual, we share our latest innovations with you. Find out what’s new by scrolling down! You are using our roundmail feature? 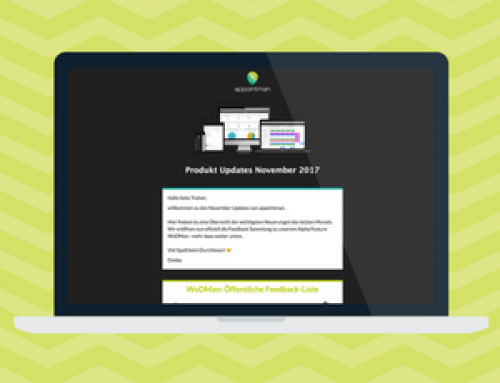 Now you have the option to sent it to specific customer groups. Simply choose the respective customer tag or the group and send it. As a bonus e-mails can also be sent to the entire lead list. Appointments can be re-scheduled and copied even in a simpler way now. This will save you a little more time. You can drag the appointment to a desired date and when dropping it the system will ask you if you want to copy or move it. Invoices for workshops can be generated automatically now. Simply activate the feature in the shop settings and your customers will receive an invoice with their next booking confirmation. In the shop there is now an option to create invoices on a free-text basis. Manually created invoices are not connected to shop products. Customer data and positions are entered manually and by clicking on “create invoice” the new invoice will be sent to the recipient. 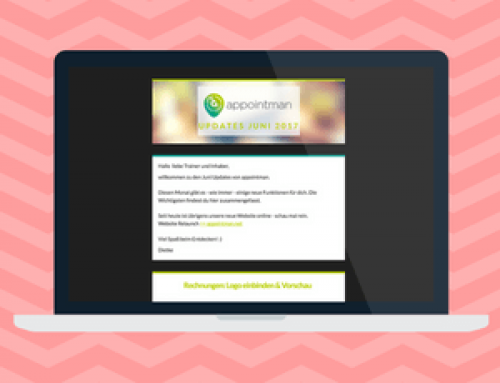 Waiting lists are already visible in the class planner and with the latest app update are also visible within the app. The request function can be deactivated under Settings > Booking rules. For standard products, the text of the book button can be overwritten. Feature can be activated in the product settings in the shop. Customers will receive a notification as soon as a spot is available. When booking appointments, customers can be marked as “no-show’s”. This way you can check in the statistics which customer has a high number of no-show’s.